Ohio is home to loads of Amish shed builders and sellers. The Buckeye State also has one of the country’s highest concentrations of Amish people, found across the state in over 50 communities. Whether you live in Cleveland, Columbus, Toledo, Cincinnati, Dayton, Canton, Akron, Youngstown, or other Ohio cities, Amish sheds can be found just a short drive away. Eric’s Outdoor Furniture specializes in backyard storage buildings, sheds, garages, gazebos or playhouses. Their products are hand-built by Amish craftsmen from Ohio. Sheds come in various styles and options and can be customized to any specifications. Buckeye Buildings of Ohio features a vast amount of outdoor furniture and buildings, including sheds. J & M Amish Contractors provides Amish workers to construct barns, sheds or log cabins. Yoder Building Company features a wide-ranging choice of portable sheds, hand-built by skilled Amish woodworkers. Various styles and designs of sheds are available in several different options such as floor, roof or siding colors. Each piece can be customized to any specifications. Delaware Sheds and Barns carries a wide range of Amish-built yard structures, including sheds, available in common styles and dozens of options. Amish-built sheds and barns available. Clear Creek Amish Furniture provides an extensive selection of Amish-made storage sheds, barns and yard barns. Quaker, Cottage, mini-barn styles available and can be customized to any needs. Amish-built sheds, barns, garages and more. Buckeye Barns provides economy Amish sheds. The Wooden Branch carries a vast array of Amish-made backyard buildings including sheds, available in common styles such as mini-barn, Quaker, Cape Cod, Dutch or Cottage. This store provides a broad choice of outdoor building, including sheds made by different manufacturers, both Amish and non-Amish. Applegate Furniture features an extensive choice of indoor and outdoor products made by Amish craftsmen. Their selection of sheds includes various styles, among others: Victorian, Cottage or Gable. Sheds can be crafted with a range of door, roof and paint color options. Amish Trails offers a variety of Amish-made products, including a nice choice of sheds. Amish-made sheds and other storage buildings available. Alpine Structure & Lumber carries a large quantity of Amish-crafted structures, including Quaker or garden sheds. Shed materials covered under various warranties. Weaver Storage Barns‎ offers Amish and Mennonite-built sheds, among a broad choice of other outdoor structures. Pine Craft Storage Barns features a wide range of Amish-made structures, including sheds, barns or garages. Selling garages, Sheds, barns, chicken coops, cabins, horse barns, dog kennels,play houses and swingsets/playsets, also poly and wood outdoor furniture, and many more items. Amish Country Furnishings carries a broad choice of manufacturers including Amish ones that provide a nice selection of hand-built sheds, available in several different styles such as Quaker, mini-barn, Victorian style, Gable or Carriage. Sheds customizable in many ways. Broad selection of Quaker sheds, mini barns, Gable barn sheds, Cottage barns, woodsheds and more, available at reasonable prices. Each piece made to last by skilled Amish craftsmen. Jack’s Amish Country Konnection offers several different sheds styles including mini-barn, Cottage, Victorian or Gable. Corner porch and railing choice available as well as numerous door options such as arch top, workshop, sliding track, overhead doors, wood or prehung metal doors. Herron’s Amish Furniture and Better Sleep Gallery features solid wood Amish furniture along with a range of outdoor products including sheds. Amish sheds available in Quaker, Saltbox, Cape Cod or Hip Roof styles. Options include roofing, siding, exposed rafters, fancy cupolas, lattice awnings, and functional dormers. Ohio residents please read: Please verify opening hours of Amish shed dealers given here. Business locations and availability sometimes change. If a business is Amish-owned as a rule it will be closed on Sundays, reflecting Amish religious beliefs. Some non-Amish dealers who sell Amish sheds may be open on Sunday, however. We try to keep the information above up-to-date, but are not responsible for changes to the above. Amish craftsmen can be found across the state of Ohio, home to over 60,000 Amish people. Many specialize in wood trades, creating furniture (both indoor and outdoor; more on OH Amish Furniture), offering building and carpentry services, and constructing outdoor structures such as mini-barns, gazebos, sheds, and other storage buildings and outdoor structures. Amish shed builders enjoy a good reputation thanks to their emphasis on small-scale production, high-caliber work, and use of quality materials. The Amish have developed a network of small businesses spanning the state and the nation. Amish craftsmen learn their trades by working in family-owned shops or neighborhood businesses, typically starting at a young age (Amish complete their schooling on finishing grade eight). Amish shed makers and other Amish businesses never grow to the size of Fortune 500 companies, reflecting small-scale Amish values. An Amish business with more than 25-30 employees is considered very large. Most have just a handful of employees, who live nearby and may be members of the owner’s church district, walking or bicycling to work each day. Many Amish shed manufacturers and other businesses employ family as help as well. Amish parents feel their children should be taught a vigorous work ethic from the early years. The two largest Ohio Amish communities can be found in the Holmes County area of east-central Ohio, and in Geauga County, nestled in the northeast corner of the state next to Cleveland and Lake Erie. Numerous other Amish communities ranging in size from a handful of families to over 2,000 souls can be found throughout the state. Amish cottage businesses, including shed makers, thrive in both of these communities and in many others. Read more on the Amish in Ohio. Amish sheds come in numerous varieties, and in many cases can be tailored to customer wishes. Wooden sheds and vinyl sheds comprise the two main categories of Amish-made sheds. Styles include Cottage, Quaker, A-frame, Cape Cod, Colonial, Dutch, Gable, Victorian, and more. Custom Amish shed options allow the prospective shed buyer to craft a shed to match the color and style of a home, or simply create an ideal structure to serve as the perfect “centerpiece” of a backyard or other outdoor setting. Amish sheds can be individualized in the doors, flooring, shingles, windows, and paint used, among other choices. Where to purchase Amish sheds in OH? Amish sheds can be had in the numerous locations across the Buckeye State listed in the guide above. Some buyers prefer to purchase an Amish-built shed direct from the maker. 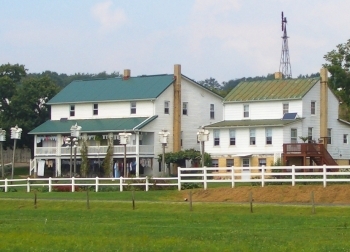 The Holmes County Amish community is a national center of Amish manufacturing, and includes a number of shed makers. Some Amish prefer to sell their products on an exclusively wholesale basis, while others will sell to retail buyers. Alternatively, Ohio residents may wish to order an Amish shed online. This option is the easiest and most convenient in one sense, as many websites of Amish shed sellers offer detailed views and information on their sheds. However it’s recommended that you view some sheds in person to get a sense of what materials and styles are like in reality. Numerous internet-based Amish shed outlets deliver their products and set them up at your home for a reasonable fee. Ellis, just drop me an email at ewesner@gmail.com. Thanks.